In 1959, graduated from Leningrad State University, the Faculty of Oriental Studies, the Section of the History of Korea. From 1960 to 2006, worked at the Eastern Department of the Academic Library of Leningrad/St Petersburg State University as a senior librarian, then chief librarian and, from 1985, as the head of the Department. 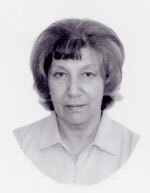 During many years she prepared The Bibliography of Academics of the Department of Asian and African studies (in cooperation with some scholars who worked at the Faculty). From 2006 up to present, a researcher at the IOM's Department of Manuscripts and Documents. At the IOM Department of the Manuscripts and Documents, The Catalogue of Texts of the Tibetan Buddhist Canon Kept at the Institute of Oriental Manuscripts, RAS. Vol. 2: Indexes, by A.V.Zorin (chief editor), B.L.Mitruev, S.S.Sabrukova, A.A.Sizova, will be discussed.